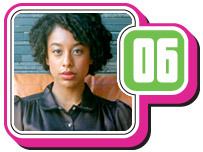 The BBC News website's Sound of 2006 poll, which used tips from UK music critics and broadcasters to find the best up-and-coming artists, has been topped by British soul singer Corinne Bailey Rae. With a beguiling blend of soul, blues and pop, she is being hailed as the UK's brightest new talent. Just two months ago, the 26-year-old singer-songwriter from Leeds released what she thought would be a low-key debut EP. But to her surprise, the media fell for her straight away. Like A Star became single of the week on two different BBC Radio 1 shows and was playlisted on outlets from Radio 2 to urban station 1Xtra. It also earned her two appearances on BBC Two's influential music show Later... with Jools Holland and the press have dubbed her "the new Billie Holiday". Bailey Rae herself says she is "shocked" at the speed of her rise - and the comparisons to a "musical genius" - but is grateful for the chance to shine after a decade of trying. As well as Billie Holiday, other comparisons have included Lauryn Hill, Norah Jones, Sade and Macy Gray. Her heartbreaking voice, which mixes girlish vulnerability with weary experience, has played a large part in sweeping both the media and fans off their feet. And her soulful and searingly honest songs make blander singer-songwriters seem redundant. With a bittersweet view of relationships, her songwriting is informed by her parents' divorce and her own marriage at the age of 22, she says. "A lot of the songs are hopeful and optimistic about love but also really realistic, from my own experience knowing that people can start off feeling so close and things can really fall apart," she says. "I couldn't write a totally rosy view of love because that's just not my experience and it's not true. "And it makes me annoyed when people do because I think it's just selling people a lie." Like all overnight sensations, Bailey Rae's seemingly sudden momentum is the result of a lifetime's work. She was a skilled violinist as a child and absorbed the "moody, dark" classical music she would hear while performing ballet. After discovering guitars as a teenager, she started her own band, inspired by female-fronted groups like L7, Belly and Courtney Love's Hole. "Those bands were modelling a kind of femininity that I was interested in, which seemed to be coming from more of a woman's point of view, rather than for male appreciation," she says. Named Helen, her band were managed by Sharon Osbourne's brother David Arden and were about to become the first indie signing to Slipknot's record label Roadrunner. But their bassist became pregnant and Bailey Rae returned university to finish her English Literature degree, working at a jazz club where she would occasionally get up to sing. "I found that a lot of soul and jazz music and a lot of indie and rock stuff that I liked had a commonality in the blues," she says. "To me, I don't find them distinctly different." Bands like Led Zeppelin played "just straightforward 12-bar blues songs", she adds. "A lot of bands that are seen as indie are actually really soulful or borrow stuff from Motown arrangements." Her early efforts to forge a soul career were supported by part-time jobs as a cleaner, waitress, barmaid and Harvey Nichols shop assistant. But the industry slowly started to take notice and she signed a record deal with EMI last year. The recent TV and radio exposure has generated a loyal following - but the singer says she is not interested in celebrity and would have preferred to "sneak out quietly". "I'd like to just keep in the background if that's possible. I wouldn't like to be really in everybody's faces," she says. "The music side of it is what I really enjoy and I like being able to sneak home to Leeds and keep myself to myself." The Sound of 2006 survey was compiled from the tips of more than 100 impartial music critics and broadcasters, who were asked to give the names of their favourite three new artists. The acts with the most tips were then ranked to compile the Sound of 2006 list.